So far in this series, we’ve looked at the players projected to fill the Oilers’ three offensive lines in 2014-15. Rather than deal with the rest of the players individually, we’ll take the rest of the forwards as a group and see how Edmonton’s total forward line-up compares to the eight playoff teams in the West last season. Players in grey have already been considered; players in the dark text have not. Matt Hendricks has been durable over his career, but I’ve projected a TOI drop from his 2013-14 run in Edmonton, a run in which Dallas Eakins played him far more than he’s played in several years. Still, more usage than he’s had in some other cities means that a declining Hendricks scores more goals than he has since 2010-11 (when he tallied nine). Boyd Gordon is going to be a critical player for Edmonton, with contributions that go well beyond his goal total. The thing that kills him offensively is his five-on-five shooting percentage, which is reliably in the 6.0 percent range (or worse); he can’t finish his chances. Despite this, he’ll probably get a bit of power play time, doing the Horcoff thing (winning faceoffs, standing in front of the net). Anton Lander isn’t in the Oilers’ top-12 group in this look because he isn’t a right wing (last year, Dallas Eakins seemed to be auditioning him for a job on this year’s defensive zone line, but he didn’t look good in the position). However, the versatility of the team’s spare forward means he’ll get some games in at centre and some on the wing, and while he won’t blow the doors off I’ve got him scoring a career high four goals after posting 18 in the AHL this year. Tyler Pitlick and Luke Gazdic are sharing the last available winger slot on the Oilers’ roster here. Pitlick will win the battle because he plays the right side and because he’s the better hockey player, but Pitlick’s injuries (he’s cursed) and a desire to get Gazdic in the lineup against Calgary and a few others mean the enforcer will (probably) play more games. Jesse Joensuu doesn’t make the team out of camp here, but assuming he clears waivers he will get some ice time later in the season. Steve Pinizzotto is in a similar situation, but like Joensuu should be right near the top of the recall list. Getting cups of tea at the NHL level are Will Acton (history with the coach, versatility, and being an established North American pro puts him ahead of the rookie centres), Ryan Hamilton (similar story here, plus he’s actually been a pretty good AHL’er), Andrew Miller (at some point the Oilers will want to recall a skill guy, and Miller came on toward the end of last year) and Iiro Pakarinen (I needed another winger to play a game, and none of the Moroz/Hamilton/Kessy trio should be ahead of the Finn at this point). I wanted to make a few quick points about methodology; those in the tl;dr crowd are advised to skip this section. I’ve assumed the Oilers as a team will be basically average in terms of the minutes they play, projecting based on the NHL median to establish the number of minutes at evens and on special teams available. Obviously, they probably don’t hit those numbers *exactly*, but for our purposes it seemed the most reasonable way to proceed. I then parceled those minutes out at the wings and at centre. I have 19 forwards playing an NHL game in Edmonton next season. Generally the Oilers are a little higher than that, but that’s also taking into account midseason trades which I have no way of predicting. The projection above assumes no catastrophic injuries. This is a big one, and it impacts our final goal projection by a lot. 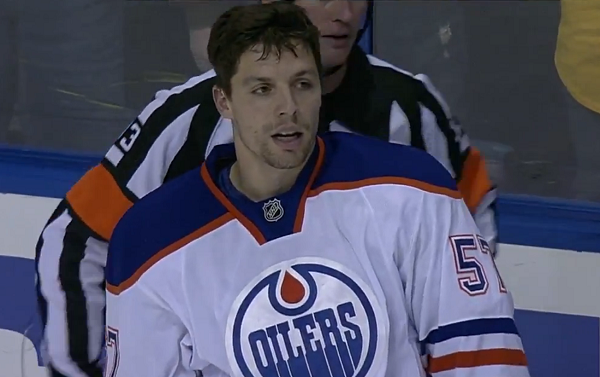 If, for example, David Perron suffers a concussion that costs him 50 games, we’ll see the goals totals of the players behind him on the depth chart go up as they take his minutes, but Edmonton’s overall projection will go down. In other words, while I think the projected total is a reasonable one, it’s one subject to adjustment down at the team level based on the real possibility of injury. 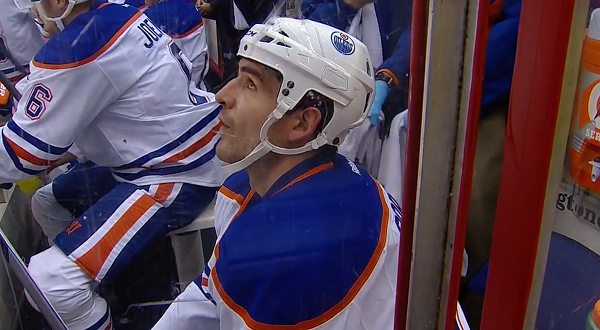 Total goals from Oilers forwards: 194. Average: 192 non-empty net goals from forwards. Assuming a healthy roster, the goal-scoring from Edmonton’s forward group should be playoff-calibre. It’s more scoring than I expected, but it comes with a second big caveat. As I went through this series, I marveled at the number of players who posted exceptionally low shots/hour rates in 2013-14 compared to their recent work, and I’m inclined to put that down to coaching. Because these projections are based on the last four seasons, those low performances hurt but had less impact than the previous years. If I’m right that it’s coaching and if it goes uncorrected, the projection above is going to be significantly on the high side. Coming next: a look at the defence, and after that we’ll try and figure out goals against. i don’t see a lot changing from last year with this group as far as goals go, unless The Nuge and Nail can get their act together. 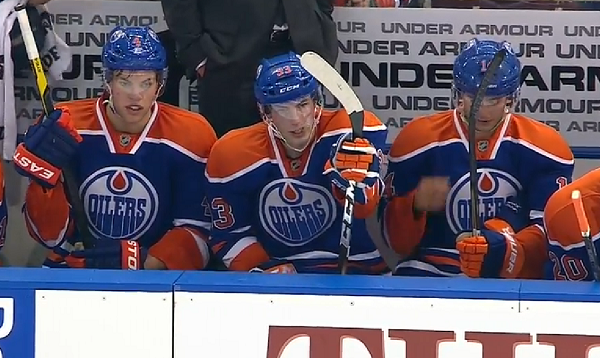 we need them to both score at least 20 goals each, but we could use a few more from Hall, Ebs and Perron as well. we lost Sam’s annual 15 or so, but may have replaced it x2 by adding Pouliot and Purcell. if they can both get around 15, that would be a bonus. i’m not expecting much from Lander despite his apparent AHL development just due to the fact he can’t skate well enough to score in the NHL and the Oiler brass keep hoping he’ll suddenly develop and NHL scoring touch like he did in OKC….i feel they’ll be waiting a long time! The Oilers’ problem was keeping the puck out of their net. Can they improve their defensive play this year is the real question. This is a very debatable comment imo. That was not their only problem. I think they were ranked around the 26th mark in terms of offence? Offense was an huge issue as well. Special teams were garbage. I agree keeping the puck out of the net was an issue, but it for sure was not the only one. I agree, I especially remember the beginning of the season when the Oilers would either be shut out, or lose games like 5-4, and 6-5. There were a lot of goals going in the opposition net at that time before Nuge and Gagner got back, but too many going the other way. Hopefully this year the team learns how to press or hold a lead. Now hopefully they can keep the puck out of the net as well. And Nuge&Yak will also produce more. Oh for sure. Now that we have some pretty good D and Lord Scrivens and Fasth probably all healed up and confident from the injury riddled season he had, GAA shouldn’t be a big problem. Same thing with Yak and Nuge. They’re both older, stronger, more confident and experienced not to mention them both gaining weight. Yeah, next year is going to be pretty interesting. Ha! Goals against? Burn the abacus! You’ll need a TI-83 with fresh batteries for that. I think the Oilers need to make up about 75 goals over last years team to become a playoff contender. So that basically means a 1 goal differential in almost every game over last season. The changes in goal should probably cover 25 of those goals leaving 50 goals to be recovered by improved forward and defensive units. Just seems like a lot of ground to make up. But who knows, maybe the swarm will magically work this year. While the MSM and many fans believe that the Oilers have lots of offensive talent, this has yet to be demostrated. This is, no doubt, in part to their atrocious defensive play but the fact remains they have not filled the net. With a projected goals for of 194 from their forwards, they will be very hard pressed to climb the standings in a meaningful way. The only possibility for significant improvement lies with RNH and Yak. If they produce at meaningful levels, then and only then, will they have a chance to live up to the offensive hype which surrounds this team. This also depends on our goalie tandem and newly acquired defensive reinforcements playing at or near potential. If they come up short, the team morale will once again take a big hit and teams will take liberties. Actually, if the forward group scores 194 non-empty net goals the Oilers should be in good shape. It’s 33 more than they tallied last season and no team with that much offence from its forwards missed the playoffs last year. Didn’t they score more goals then both L.A & the Wild last year? really not that far off the rest of the teams? My concern isn’t scoring goals it’s keeping them out, the Oilers goal differential was brutal, obviously scoring is a huge part but if the Oilers let that many goals in again it’s going to be tough regardless of the increase in scoring. Please show me the MSM who said the Oilers have lot of offensive talent? Who says this? For the last three years Gregor and Strudwick said the team wasn’t as skilled as the organization said, and they were right. Eakins was the first coach or person in the organization who said the team wasn’t as skilled as they thought. I think the Oilers will improve this year and we will see more offence from this team, but up until this year I didn’t see them as proven scorers, just “potential” scorers. ^good NHL players should be able to adapt to any coach….Eakins isn’t the problem in my opinion. On the other hand , I doubt that Eakins was the solution to our problems either for last season . Having 7 different coaches in 7 years and your bound to have bad years with so many different systems , etc., even for good veterans as we found out .Disagree that Eakins was not part of the problem as well . ^i think that has been more the problem than Eakins….the revolving door of coaches while our illustrious GM tried to figure out how to rebuild a team. this is why i don’t want yet another head coaching change. bring in the assistants you want to go along with Keith Acton, such as Craig Ramsey, and continue moving forward. thank God our top players seem to want to play for Eakins….the rest that don’t can go out the door and probably have…. Good coaches come up with a game plan that makes the most of their players skills, they have their team ready to start the game and they make in game adjustments to help the team. All three things Eakins failed miserably at last season. Eakins needs the talent to do all that and just didn’t have enough of it last year….let’s see if he does this year? I found it was not so much strictly goals against as it was time spent chasing the puck. There’s probably a stat out there that captures how much time a team spent without the puck in its own end while at evens (or even with the man-advantage). I’ll bet the Oilers of the last 3 years would be near the bottom of that particular group. The fire-drills have to come to an end to get any further up the table. I knew it!! We are going to win the cup!! I love the projection time of the year.. By far the happiest part of my oiler fan season!!! All of these numbers are based on historic individual stats. When players gel as a group (ex.-Hall/RNH/Ebs) their numbers generally go up. Last year our coach never allowed much chemistry to develop when he constantly mixed up the lines. In other words, TEAM play can cause a big swing for individual production. Sadly, basic stats won’t show us how coaching and chemistry might alter the numbers. If you were to use VERY advanced stats, you would also know that there is an 57% chance that a core player will receive a llama as a Christmas gift. Those same stats would also show a 26% chance that we could see a llama-related career ending injury this season. GOAL DIFFERENTIAL tells quite the story of playoff bound teams . WEST : L.A. 6th with 206 GF and 174 GA for + 32 goal differential . Minnesota 7th with 207 GF and 206 GA and only +1 goal differential . Dallas 8th with 235 GF and 228 GA for a +7 goal differential . Oilers were 203GF and 270 GA for a whopping differential of – 67 . East : Philly 6th with 236 GF and 235 GA for only + 1 . Columbus 7th with 231 GF and 216 GA for + 15 . Detroit was 8th with 222GF and 230GA for the only negative of all playoff teams at – 8 . With 30 more goals this season we would be well on the offensive side to playoffs . How much can we get the GA down below 230 GA is the hard part . Edmonton’s offense was 24th in the league last season. They’ve lost a few offensive players, such as Gagner and Smyth, added a few replacement level players and one hot lottery pick rookie. Draisaitl’s NHLE is 40.4, but players his age jumping from junior directly into the NHL often struggle to reach their NHLE. My money says Edmonton treads water in offense unless Draisaitl turns in a Calder worthy performance. It’s depressing and tedious to go through all the goalie drama last season, but that also played a big role in the Oiler’s woes. The Oilers had the 27th worst overall sv% last season and their goals against was dead last in the league, a full 24 goals behind even Buffalo! Scrivens looks capable of being league average or better next season, but so did Dubnyk at the start of last season. Fasth has played too few NHL games for us to say how good he’ll be. Both of these guys are going to be in for some serious challenges whenever Fayne isn’t on the ice. Still, if Scrivens doesn’t implode like Dubnyk, the Oilers’ overall sv% should improve. That’s going to help the team immensely. A better tested backup would be nice to have, but at this point I see no reason to think Fasth will be around for long if he struggles. Edmonton’s real problem is defence. The blue-line was a hot mess last season and the Oilers allowed more shots against than all but four other teams in the NHL. Now it’s a hot mess behind one actual first pairing defender! Will Darnell Nurse join the team next season? It’s tough to say, but at 19 he’s probably not a first-pairing difference maker just yet. Still, there is a definite improvement here, but not nearly as much as will be needed to make the playoffs. The Oilers don’t have much in the way of defensively responsible forwards either, which makes the weakness of their blueline even more apparent. The Oilers worst players are still AHL-caliber, and their opponents will take advantage of them. The Oilers should improve next season, but they are probably not going to be a playoff team. Should be really interesting to see what happens if the 1st or 2nd line center go down for any amount of time for the Oilers. They’re still vulnerable even if the make a deal for a centerman before camp begins. Is it possible that the Oil low shot total from last year was because they had no player types that drove to the net (apart from Perron)? Consequently, low percentage shots with the hope of a rebound/deflection weren’t taken. This year, with the additions on the wings, the Oil may take a lot more shots as they have some greasy players heading straight to the blue paint. I predict an increase in shots and a correlating increase in goal mouth goals. Oilers need to win more then 40 game to make the playoff. 33 more goals from this group? Maybe. The secondary scoring is much better but Eberle/Hall/Perron aren’t going to do much better than their combined 83 goals last year. If this happens however I think it comes at a drastic reduction in goals against. The only way the Oilers improve by that much is because they’re spending much less time in their own zone and thus more time in the offensive zone. This is essentially a zero-sum game so if we’re adding at one end we have to be dropping at the other.